Allium platycaule is a species of wild onion known by the common name broadstemmed onion or flat-stem onion. It is native to northeastern California, south-central Oregon (Lake County) and northwestern Nevada (Washoe and Humboldt Counties). 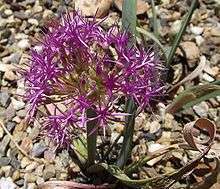 It is found on slopes of elevations of 1500–2500 m.
Allium platycaule grows from a gray bulb two to three centimeters wide. Scape is thin and strongly flattened, up to 25 cm long but rarely more than 7 mm across. It may be thicker along the midrib and much narrower along the sides. The long, flat leaves are sickle-shaped. Atop the stem is an umbel which may have as many as 90 flowers in it. Each flower may be up to a centimeter and a half wide but the tepals are quite narrow so as to be almost threadlike. The inflorescence therefore may appear be a dense ball of filaments. The flowers are generally bright pink to magenta with yellow anthers. The leaves, bulbs, and seeds were utilized as food by the Paiute people. ↑ Watson, Sereno. 1879. Proceedings of the American Academy of Arts and Sciences 14: 234.